Milwaukee is a weird club. They have a decent 40 man roster and should be far more exciting than they are. Offensively, they look so good, but the rotation is a solid, “meh.” Everyone is a year older, and they’re now without Rickie Weeks and Lyle Overbay, but they’ve been replaced with decent enough guys, so it’s pretty much a wash. They didn’t do much to improve, but they really didn’t have to. Last year they began dominant, then had some ups and downs, and finally the wheels came off late in the season. Fans of the Brew Crew think it would be pretty cool if they could keep it together this year down the stretch enough to contend again. The starting lineup is one of the best in baseball, and if everyone stays healthy and puts up similar numbers, they could be right back in there. Ho boy, MVP speculation has already begun on Brewers fan sites with last year’s NL doubles leader. Coming off his first year as an All Star, Lucroy is in his prime and should be in for another great year offensively and defensively. It is ridiculous that he only made 3 million dollars last year. He is probably the best catcher in the game, but because this is the NL he’ll play some 1B. You could say Lind was the biggest addition to the club this season, and the most significant upgrade. He’s battled back issues in spring training, but if he can stay healthy he could have a nice year. He isn’t the guy he once was, but should be serviceable. If he could be the DH I’m sure he would be. I wouldn’t expect him to appear in more than 100 games as he’s dealt with these back problems for the past four years. Could be due for a big season. He’s shown a lot of promise so far in limited time with the club, and with Rickie Weeks out of the way second base is all his. Was an All Star in 2013 but regressed quite a bit last year. Just in case that continues, the Brewers acquired the prospect Sardinas (listed below and starting the year out on the bench). If Segura can turn it around he could be traded at the break. The aging All Star says this will be his last year before retiring. The Brewers are currently working on a plan for him at 3rd and to spell him with regular days off. Last year was pretty good for him, and if he can at least replicate those numbers I don’t see any reason he couldn’t head to the AL as a DH or something next year if he wants to keep playing. Put up decent numbers last year, hitting over 20 homers batting in the bottom half of the lineup. The Brewers would obviously like him to hit over .250 this year though, and he’s had a great spring offensively so we shall see how it goes. He’s also been working on his throwing arm, which is a weakness in his game. CarGo2 is coming off another great season, and nothing seems in the way of him repeating that again. He is a back-to-back All Star, and there’s no reason to think he won’t be looking at a 3rd straight trip in the prime of his game, unless his back continues to bother him. Battled thumb issues last year, his first steroid-free. His stock is at an all-time low, especially after a down season and his embarrassing A-Rod like denials in media appearances surrounding his 2013 suspension. He is still slightly better than average, though. He’s also in the middle of a court case where his friend since middle school is suing him for non-payment of legal services. It would be hard for me to get my timing down with all that in the back of my mind, too. Has a great arm, so he could spell Lucroy (who can play 1B). Not much of a hitter, though. Depth guy, good defense and that’s about it. Can play anywhere, caught in spring training too. Much more promising than the other Luis in the long-term, but sent to minors. Possibly the future SS of the club. Outfield depth who seems to get progressively worse the more time he spends with the big league club. More than a 4th outfielder, he can actually hit and is a two-time Gold Glover. Some intrigue here, if anyone struggles or is injured in the outfield expect him to step into a starting role. Could play a similar role to Nori Aoki, who is now in SF. I dunno man. I guess no one is excellent and no one is terrible. The did lose their best two guys including their ace, so it looks worse, but Peralta could take a big step forward. The problem is Garza could take a big step back. Steady veteran presence. Lohse’s now 36 years old, but he should have another decent season or three under his belt. Fun trivia fact: as a member of the Nomlaki Tribe he’s one of only three Native American players in the MLB. is dealing with a rough spring and has been tinkering with his mechanics. Coming into year two of the most expensive free-agent signing in Brewers history, Garza hasn’t been the steady veteran presence that was expected. Still, he isn’t terrible by any means, and if he stays off the DL this year it’s possible he makes the contract worth it. That’s a big if, as he missed a month last year and durability has been a concern with him over the last few years. Only 25 and already the bright spot on the pitching staff, Peralta could become the ace as he comes into his prime. He has the stuff and the confidence. He’s steadily gotten better year over year and could be in for a big year this season. Or not. Fighting through shoulder fatigue and bouncing back and forth from the bullpen to the rotation, the Brewers look to see what they really have with Fiers, naming him to the rotation this spring. Some are high on him, but he hasn’t pitched enough in the big leagues yet to have a definitive answer. Fiers was the guy who hit Giancarlo Stanton in the face last year. He also hit the next batter he faced, causing a bench-clearing brawl. If he’s just “better than Jimmy Nelson,” the Brewers better hope for a lot of run support for the bottom of their rotation. Young guy who should get his first crack at the starting rotation. He was with the club a bit last year and appeared shaky, but that’s to be expected when you’re an average rookie at the bottom of an average rotation. Wait did I already write this about another club’s 5th starter? 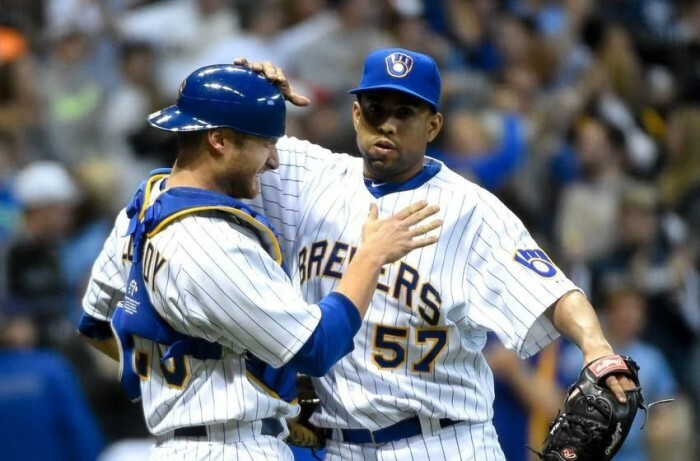 The bullpen will be a strength again, and the Brewers are pretty deep. They recently declined to add Chris Perez to their 40 man roster, and when you can do that, you should. Well, they brought back K-Rod. He resigned with the club in the offseason, meaning Broxton (below) will not get a chance to close. He was an All-Star last year, and he’s always been a decent closer. I guess it was one of those “Hey, remember me? !” type things, and the ASG happened before the team’s epic collapse in the second half. He did have more saves than he’s had since a remarkable 2008 season, however. Wow, how many 300 pound pitchers do you think there are besides Broxton? Former Royal alert! Broxton’s only brush with MLB history was he lost a game in the closing role for KC by issuing back to back HBP, forcing in a run. He’s the only player this century to do that. Broxton’s been okay, but last year was a bit of a downer for him. He probably won’t close again in his career since K-Rod’s back. Former Royal alert! Brewers traded Nori Aoki to KC for a pretty consistent relief pitcher with a great name. Did you know he reached out to the other Will Smith to see if he wanted to hang out? No response yet, but we’re waiting with bated breath. I don’t know what’s in the water up in Omaha that develops all these great relievers, man. The Royals AAA club is just a factory for relief pitching. Former Royal alert! Jeffress returned last year to the team that sent him to KC in the Zach Greinke trade in 2010. Jeffress has epilepsy and has self-medicated with marijuana in the past, but he seems to have put the issue behind him and there is optimism that he will have a good season, building on a good year last year. Hmm… why? There are probably better options in AAA that cost way less than the $4 million the Brewers signed him for in the offseason. He had a great 2013, but regressed mightily last year and has had a rough spring. He’s also 35 and probably in his decline phase. Why is he making almost as much money as Lucroy will in 2015? Being stretched out this spring just in case Fiers isn’t ready. He spent part of the season last year on the DL and it looks like he has a partially torn UCL so they’re being super careful with him. He received injections for it, but he will probably eventually need TJ surgery. Looks like until then, they really need him, and they’ll use him. sent to minor league camp for rehab assignment. Optioned to AAA, but should be back occasionally. The pieces are about the same as last year, minus a couple of starting pitchers, Overbay & Weeks. I really doubt this team can duplicate their excellent first half from last year. I mean, they could end up with a very similar overall record, but they probably won’t come roaring out of the gates only to crash and burn. More likely they’ll plod along and miss the playoffs but be slightly above average.